Posted on: April 30, 2018 By: Christopher Brown, Esq. As technology rapidly advances more and more people are plugging into amazingly sophisticated cell phones to text their friends, use apps, or search the internet. Nowadays, cell phones have become a necessity in everyone’s life, even children! To most, cell phones have now graduated to playing an even more vital role while driving. In order to constantly stay connected to friends, family, and coworkers, or drive for Uber, cell phones have become a necessity in the car for plugging in on the go. However, cell phone use in the car has contributed to a number of cases where distracted driving has hurt and even killed people. 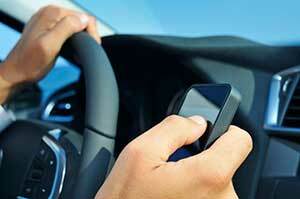 increasing numbers of cases report cell phone usage in the car as causes to reckless driving. Because of this, many states have cracked down on using a cell phone while driving, with some states’ laws are more stricter than others. Punishing cell phone driving laws in Virginia have recently been enacted, and police are cracking down on violations more than ever. In Virginia, talking or texting on a cell phone is a crime so it’s important that Virginia residents are familiar with the laws so they don’t get arrested or fined for breaking cell phone driving law. This blog addresses topics on current laws, potential legislative bills, and the importance of hiring a traffic defense attorney so Virginia residents can learn to comply with the law and avoid receiving infractions. Though it is extremely important to comply with Virginia state law, cell phone driving laws in Virginia are less strict than those in some other states. One example is that they do not completely ban the use of cell phones while driving for everyone. Those banned from cell phone use are bus drivers and teenagers under the age of 18. Those 18 and older are allowed to use their cell phones in the car as long they aren’t texting and driving. Texting is banned for all drivers, which includes the act of looking at, typing, or using voice command to send or receive text messages or emails of any kind. Those over 18, are allowed to use Bluetooth hands free cell phones. Cell phones can also be used when a car is stopped or parked in a legal area, if is an emergency vehicle, when using a GPS, and when a driver is reporting an emergency. Failing to follow any of these cell phone driving laws in Virginia will result in fines. Those 18 years or older, who are caught texting while driving or holding a cell phone in their hands will be pulled over by police and may be charged with primary offense. For those under the age of 18 being caught with a cell phone is a secondary offense, which means that the police must have another reason for a teenager to be pulled over, such as reckless driving. They cannot charge them with a traffic violation if the teenager is just seen with a phone in their hands. First offenses have a fine of $125 while second and subsequent offenses have a fine of $250. The current cell phone driving laws in Virginia may not be the only laws that will be put into effect. The Virginia State Senate just passed a bill that bans any use of a handheld device while driving, which of course includes cell phones. The bill states that the laws will be revised to ban all handheld cell phone use, including using a GPS system. In order to use a GPS, the phone has to be mounted to the dashboard or another part of the vehicle. The bill also states that first offenses will carry a fine of $125 and will count as a traffic violation, while second and subsequent offenses carry a fine of $250. There are however, some exceptions to this new bill. Cell phones used in emergencies will not count as violations of the law, neither will cell phone use when a car is legally parked or stopped. Exceptions also apply to Department of Transportation vehicles, those using radios or radio-like devices, and those using features built within the car. While the state Senate had managed to pass the bill 29-11, it is still unclear whether or not it will truly pass. The original bill condemned anyone who was distracted by a cell phone and enacted a fine of up to $500. This was implemented the House in hopes of cracking down on the number of traffic violations due to driving while using a cell phone. The current bill was created as a compromise for both the current cell phone driving laws in Virginia and the full cell phone ban. Some people have high hopes that the bill will pass, though some have their doubts. It is only in the control of Virginia state legislators as to whether or not it will come to pass. If you have been recently charged with a cell phone driving infraction, then it may be best to hire a traffic defense attorney. A traffic defense attorney has the necessary experience to represent you when charged with a driving infraction and will ensure your rights are safely protected. They are also there for you to provide key information on the various cell-phone traffic laws and penalties that could result if you violate these laws. By hiring a traffic defense attorney, you can rest easy knowing you will be under the care of an experienced and reputable counselor. If you are charged with a cell phone driving infraction, make sure to contact a traffic defense attorney to represent you in court as soon as possible.